WASHINGTON — A Senate committee voted along party lines Wednesday to advance President Donald Trump’s picks for key posts at the Environmental Protection Agency over the objections of Democrats who pointed to the nominees’ past work for corporate clients they would now regulate. Republicans on the Senate Committee on Environment and Public Works used their one-vote majority to move five nominations forward to the full Senate. They include Michael Dourson to lead EPA’s Office of Chemical Safety and Pollution Prevention and Bill Wehrum to lead the agency’s Office of Air and Radiation. The Associated Press reported last month that Dourson, a toxicologist, has for years accepted payments from chemical companies to write papers pushing back against peer-reviewed studies raising health concerns about his clients’ products. Past corporate clients include Dow Chemical Co., Koch Industries Inc. and Chevron Corp. His research has also been underwritten by industry trade and lobbying groups representing the makers of plastics, pesticides, processed foods and cigarettes. Wehrum is a lawyer in private practice whose clients have included pro-fossil fuel groups opposed to mandated reductions of planet-warming carbon emissions — including the American Petroleum Institute, the American Fuel and Petrochemical Manufacturers and the American Chemistry Council. Democrats said those longstanding financial relationships represented a conflict of interest for Dourson and Wehrum as they become the regulators of their former corporate clients. Committee Chairman John Barrasso called Trump’s nominees well-qualified and experienced. 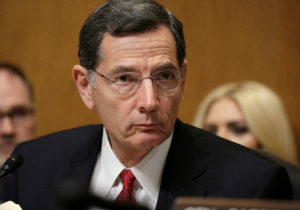 “Their confirmation will fill critically important roles in ensuring that all Americans benefit from clean air, clean water and clean land,” said Barrasso, a Wyoming Republican. The committee also advanced the nominations of Matthew Leopold to serve as EPA’s assistant administrator for the EPA’s Office of General Counsel, David Ross to lead EPA’s Office of Water, Paul Trombino III to serve as administrator for the Federal Highway Administration and to reappoint Jeffery Baran as a member of the Nuclear Regulatory Commission. 2017 is on track to be a record-setting year for massive natural disasters in the U.S.